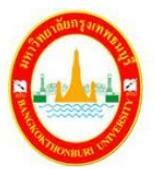 (Mr.Jurin Laksanavisit) to change its status from Bangkokthonburi College to Bangkokthonburi University (BTU). Bangkokthonburi University (previously called Bangkokthonburi College) was founded on January 28, 2002 by Dr.Bang-orn Benjathikul who realized the paramount importance of human resource development of the nation and strongly desired to meet the need of the community, the students’ parents, the alumni of Krungthep Commercial School and polytechnic Krungthep Commercial School, as well as the youths and the people throughout the region. Bangkokthonburi is located in two areas having 219 rai, 3 ngan, and 94 square wah in totality. The first area is located at 16/10 Moo. 2,Liab Klong Taweewattana Road, Taweewattana Subdistrict, Taweewattana District, Bangkok 10170; the area has 188 rai, 2 ngan, and 8 square wah. And the second area is located at Sra-Krajome Subdistrict, Don Jedi District, Suphanburi Province; the area has 31 rai,1 ngan, 86 square wah. Since the first area of BTU is located in the suburban area of Bangkok, it is very convenient for commuters in that they can travel to BTU by car, bus and other kinds of vehicles with ease. Surrounded by various government agencies, BTU is in a better position to perform the four-fold functions of the university as stipulated by the Education Ministry without any difficulty. Since Bangkokthonburi College came into existence several years ago, the institution has perfectly performed the four functions stated by the Education Ministry. BTU has performed its functions with great effectiveness and efficiency. That is to say, it provides quality learning and teaching activities to the students; it encourages and supports faculty members to undertake research; it makes all efforts to provide academic services to the community and external organizations; and it is continually involved in the promotion and preservation of Thai culture. As a result, BTU’s performance has been recognized by the community, the society and the nation. BTU has a strong conviction to expand its educational activities to reach the people in all regions of the country, hoping that all Thai people would have an equal opportunity to gain access to quality education and to become well-informed about the changing world.